The United States is sending firefighting equipment to Russia to help officials there respond to the 500 wildfires burning across the country. The White House says President Barack Obama called Russian President Dmitry Medvedev Thursday morning to express his condolences for the losses his country has suffered. Heavy downpours have cooled the Russian capital after weeks of no rain and unprecedented heat, but dozens of wildfires are still raging around Moscow and a new blaze was spotted near the nation's top nuclear research center, officials said Friday. The city remains largely free of the clouds of suffocating smog that affected it earlier, but weather experts say smoke from burning forests and peat bogs may choke the city later in the day if the wind direction changes. Russia's Emergency Situations Ministry said its teams have managed to reduce the area covered by wildfires, but more than 500 are continuing to burn across the country, including 29 around Moscow. 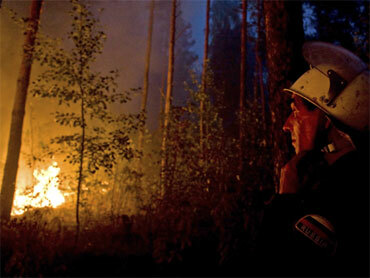 It said about 14,000 firefighters are battling blazes around the Russian capital. A new wildfire also started east of the country's top nuclear research facility in Sarov, 300 miles east of Moscow. The blaze spread quickly, prompting firefighters in the region to call reinforcements from neighboring areas, according to the region's emergency headquarters. Earlier this month, massive wildfires around Sarov, the birthplace of Soviet nuclear weapons, prompted the nation's nuclear agency to move all explosive and radioactive material as a precaution. Reinforcements, including aircraft and robots, helped stem the blazes. Sergei Novikov, a spokesman for the Rosatom state atomic corporation, said that the radioactive and explosive materials have been moved back to Sarov after the fire situation had stabilized, and there was no immediate need to move them out again. "There is no threat now to the state nuclear center," he told The Associated Press. Another potential danger comes from wildfires in areas contaminated by the 1986 Chernobyl nuclear disaster that may raise radioactive particles into the air and spread them over broader territory. The authorities have insisted that all wildfires in the Chernobyl-affected regions have been quickly dealt with and radiation levels have remained normal. The national weather service on Friday said it had dispatched a team of radiation experts to constantly monitor the radiation level in the western Bryansk region, the area of Russia that suffered most from the Chernobyl catastrophe in Soviet Ukraine. The heat, unprecedented in 130 years of record-keeping, has cost Russia more than a third of its wheat crop and prompted the government to ban wheat exports through the end of the year - a move that has sent soaring world grain prices to new highs. Domestic grain prices in Russia also have been rising, and the export ban hasn't driven them down. Officials in Moscow have registered a 10-percent price hike in the retail prices for bread in late July and early August. Prime Minister Vladimir Putin met Friday with the head of the nation's anti-monopoly agency, Igor Artemyev, and urged him to quickly punish those who try to drive prices up. "They better act in accordance with the law, or they would face fines which would far exceed profits they are to win from speculation," Putin said. Artemyev said that the companies that engage in "unjustified" price hikes could face fines of up to 15 percent of their total sales volume on annual basis. The White House says several U.S. agencies, including the Defense Department, and the state of California are airlifting firefighting equipment to Russia to help combat the fires.